Above: The prophecy is revealed to Amfortas as he prays before the Grail. Painting by Franz Stassen. Is Parsifal a Christian work? If not, then what did Wagner mean when he described it as such? What if anything does this opera say about Christianity? Is it meaningful to speak of Wagner as theologian? Wagner's Parsifal poses a riddle that is hard to solve. The sacred character of the work is beyond question; this is obvious as well from the music of this "stage consecration festival play". But what form of the sacred are we dealing with here? Wagner's turn to Christian mythology, upon which the imagery and the spiritual contents of Parsifal rest, is idiosyncratic and contradicts Christian dogma in many important ways. In the case of a religion of revelation that is almost two thousand years old, and that in the course of its history has assumed huge societal significance in the Western world, and quite early canonized rigid articles of belief, are we allowed even to talk of "myth"? But how else can the action of Parsifal be understood, if not in the category of myth? Furthermore, as Wagner understood it, "myth" is a distinctive way of thinking that has its own logic and truth. It distinguishes itself from the rationality of philosophy through its use of images and the archetypical nature of its forms and characters; it differs from dogmatic religion by the freedom with which it undertakes to re-form and re-create traditional elements to revitalize them. The philosopher Hans Blumenberg coined the phrase "work on myth" [Arbeit om Mythos] to describe this process. And if it is not a Christian work, as opposed to a work which is to a large extent about Christians (though remember, the Christ is never referred to by name) and their failings and eventual salvation, what is the significance of the celebration of the Eucharist in Act I, the prayers that can hardly be addressed to anyone but the Christian God, the point of Parsifal's baptising Kundry and telling her to have faith in the Redeemer, and much else besides? Above: Derek Welton as Klingsor, © Bayreuther Festspiele. ... the old question is posed anew: Parsifal — is it a Stage Dedication Festival Play in the Christian spirit? It is unchristian, say many Christians today, because Wagner, that neo-heathen, has desecrated the Holy Sacrament. 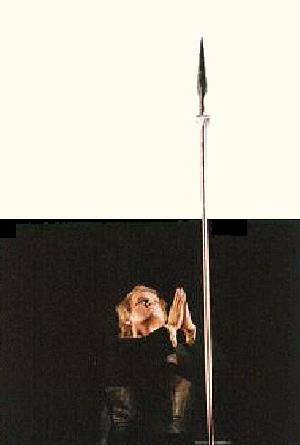 It is all too Christian, say many music-loving neo-heathens, following in the steps of the later Nietzsche, for Wagner, after all, went on his knees before the crucifix [according to Nietszche] and thus consecrated himself as a member of the High Consistory. Can the argument be settled once and for all, or is the work perhaps both Christian and heathen at once? Is it perhaps the work of a great dialectician who was always able, in both life and art, to reconcile the irreconcilable, to resolve it in a practiced synthesis? What criteria may one apply from today's point of view, considering the fact that we children of a Christian or post-Christian age are ourselves possibly not quite clear in our minds as to where the border lies between Christianity and neo-paganism? n her Cambridge Handbook, Lucy Beckett speaks of the work's steadily maintained Christian frame of reference . This seems to miss the point that Wagner made right at the start of his essay, Religion and Art: One might say that where Religion becomes artificial, it is reserved for Art to save the spirit of religion by recognising the figurative value of the mythic symbols which the former would have us believe in their literal sense, and revealing their deep and hidden truth through an ideal representation. Wagner's final drama is an attempt to rescue the core of religion by transforming it into art and thereby through "work on myth" [Arbeit am Mythos] to reveal anew the message of Christianity that had in his view become corrupt... in the final text Wagner more strongly emphasises another layer of meaning: the drama of the suffering Christ, the unredeemed Redeemer. This idea can be found in the earlier  sketch in a rudimentary form but now [in 1877] it becomes associated with a new complex of notions that resulted from Wagner's study of early Christian and Gnostic sects. According to Wagner, there followed no resurrection and no ascension into heaven. Rather, Christ surrenders himself to mankind in the form of the relics that He leaves behind: the cup from which He and His apostles drank at the Last Supper and the spear that inflicted the wound in His side. The religion of compassion, which Christ founded with the sacrament of the Eucharist and the Last Supper, was then passed from one generation to another by Christ's followers, who lived accordingly. 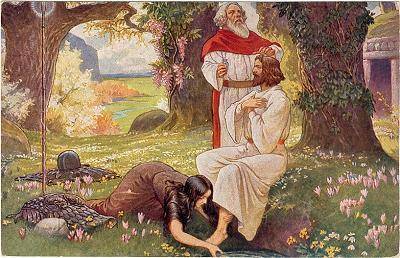 Titurel, Amfortas and Parsifal are followers of Christ... It was important to Wagner that mankind understand [the mission of Christianity] as one of imitation [Nachahmung] of Christ and that redemption consists in this imitation of Christ. Rather than the almighty God of the Judaic-Christian tradition, Wagner chose as his deity the dependent, suffering god-man who laments the betrayal of a sacred mission. Parsifal is about a religion of compassion that is sorely in need of renewal. o despite Wagner's description of the work, for the benefit of King Ludwig, as a Christian parable, it would be more accurate to say that he made use of the symbols of Christianity, together with some elements of Buddhist philosophy, to convey his own message. Indeed, as the author has shown in a separate article, as far as the second act is concerned, it might be more accurate to speak of a steadily maintained Buddhist frame of reference . We should also keep in mind that Wagner had an ambivalent relationship with Christianity; as a disciple of the atheist Schopenhauer, Wagner did not believe in God, although he told Cosima1 that he did believe in divinity (by which he probably meant 'o Θεός ; see Religion and Art). Godhead is Nature, the Will which seeks salvation and, to quote Darwin, selects the strongest to bring this about. It is deeply significant that the second crucial moment in the opera takes place not on Easter Day but on Good Friday: on the day of the passion of Christ, not of his resurrection. Gurnemanz corrects Parsifal: it is a time for rejoicing, for the sacrifice of love that has already set men free. The spring of new life is here, as Parsifal himself comes to see and to proclaim to Kundry. The interpretation is not that of orthodox Christian doctrine and devotion, but it does express the significance that Wagner himself found in Christianity. The emphasis was on "the deed of free-willed suffering", not on the triumph of love which had overcome suffering: on "the love that springs from pity, and carries its compassion to the utmost breaking of self- will" which he claimed to have found in Schopenhauer's ethics, as he found it in Christianity. Schopenhauer, we know, points to the renunciation of the will- to-live; but mere renunciation, however unselfish, does not imply renewal, nor did Schopenhauer look for it. Left: Bayreuth postcard showing Gurnemanz consecrating and anointing Parsifal on Good Friday (act three). n his references to Christ, Wagner was concerned with Christ's act of selfless sacrifice: for him, Christ was the archetypal sinless sufferer. Since Wagner denied that Parsifal was a Christ figure, it is argued by Lucy Beckett that Gurnemanz' Du - Reiner! - Mitleidsvoll Duldender, heiltatvoll Wissender! is not addressed to Parsifal, but to Christ: this makes a profound difference. On the other hand, this may be Wagner's deliberate ambiguity. Jesus of Nazareth [for Wagner] overcomes egotism by consciously taking suffering upon himself. Thereby he succeeds in transcending the laws of nature. Wagner summarises the unnatural and wondrous nature of this deed with the concept of the divine. For Wagner, Christ becomes the ... "embodiment of consciously willed suffering ... which pours forth a divine compassion through all mankind, as its first foundation" [Heldenthum und Christentum]. The late mysticism of suffering that Wagner devised can only be understood against the background of Schopenhauer's philosophy. On the other hand, it becomes clear that Wagner valued voluntary suffering also as a conscious opposition to the contemporary belief in progress. The figure of the sinless sufferer remains compelling; he was all that Wagner wanted of Christian tradition. But, if he is no more than this, what becomes of his relationship to Parsifal? Parsifal himself has suffered for Amfortas in the moment of temptation by Kundry; he has overcome the temptation and can now heal Amfortas' wound. If Christ has become simply the sinless sufferer, is it not possible, whatever the differences between them, to see a similarity, and thereby to see what happens as somewhat [sic] that happens not between man and God, to be spelt out in the language of traditional Christian doctrine, but between man and man -- a possibility that we may reveal to each other within the limits of the human condition? For Parsifal is a work of perfidy, of vindictiveness, of a secret attempt to poison the presuppositions of life -- a bad work. The preaching of chastity remains an incitement to anti-nature; I despise everyone who does not experience Parsifal as an attempted assassination of basic ethics. As a theological observer of this work today it is impossible to overlook the fact that that very aspect in Parsifal which generations of Christian Wagnerians have acclaimed as the culmination and purest embodiment of Christian moral ideals has become alien to us in many respects. Not only is it alien to us because — true to a century-old tradition — in this work the Christian religion is still identified with moral purity, and sin is reduced to the single moral transgression, thereby ignoring the innate sinfulness of mankind as well as the wrong fundamental attitudes, basic tendencies, basic opinions and involvement of the individual in social guilt. Alien to us also is that here the instinctual structure of mankind is largely limited to the sexual drive and that renunciation of the fulfilment of desire is declared to be the Christian ideal as such. Alien to us in particular is that this appeal to renunciation goes hand in hand with the (historically all too familiar) stereotyped negative representation of woman as seductress, corruptor, "femme fatale", whose beauty ... has demonic features, so that her redemption through man makes her — equally stereotyped — into a penitent and patient sufferer. It is not that there could not and should not be a practice of renunciation, of chastity and asceticism based on, and indeed encouraged by, Christian principles. It is only the unrealistic general Christian idealisation which identifies the Christian way of life with a kind of monastic ideal that seems questionable in Parsifal. Furthermore, the extent to which the cross has become the instrument of exorcism at the end of Act 2, by whose help Klingsor's pleasure garden is turned into a wilderness, and how, during the sacrament of baptism at the beginning of the third act, the domestication of a woman's misspent existence, which seems to be finally sealed through her baptism, is very much more in the foreground than the element of the remission of sin and of new life (the sinner must die). No, all this has more to do with the moralisation of religion and of the ideologising of the Christian religion into a superstructure above bourgeois culture, than with an original Christian comprehension of chastity, ascenticism, abstinence and Eros; and as Christian viewer of this work one cannot simply discount all this if one does not with apologetically to justify the Christian elements in the work or — in historical aloofness — slur over them as the trappings, dictated by the period, of a timeless theme. Objective criticism remains the necessary prerequisite for detachment from the work; but it can also be a means of finding a new position. No-one would argue that all those points criticized here are not necessarily Wagner's fault. How often has the attempt not been made among theologists to advocate a "Christian" ideal of divinely pure love, agape (charitable love, continence) to the detriment of a "heathen/ worldly" concept of love, Eros (desirous love, instinctive sexuality)! It is, of course, incontestable that there is, and must be, a difference between a desire which egocentrically seeks its own ends, and a charitable love which seeks the good of the other: that is to say, the difference between a possessive love and a love which is worthy of the name, and which we encounter particularly in the message and life of Jesus of Nazareth. But one would misunderstand him if the difference between egoistic and true love were to be equated with the difference between eros and agape. As if only agape could be the true love and not eros too! 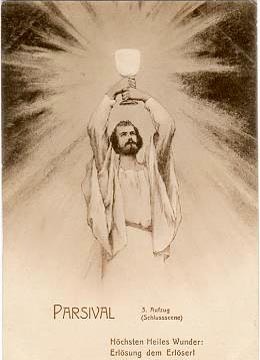 Right: Bayreuth postcard showing Parsifal as new Grail King, elevating the radiant Grail (act three). Amfortas is not a sinless sufferer. He has been destroyed, in body and mind, by Eros. He has been wounded by the holy spear, possibly (it is not said explicitly) whilst it was wielded by Klingsor, who took the weapon from him. What is more, Amfortas has been wounded in his side, in the same place as Christ. 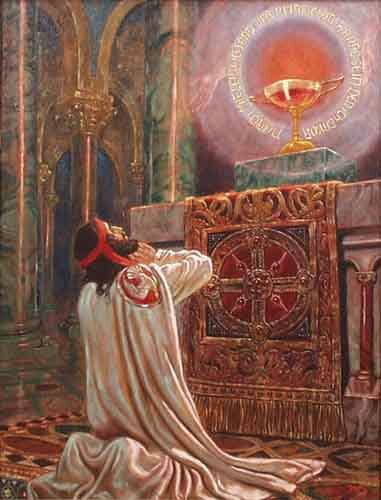 As high priest, he stands for Christ during the religious ceremony of the Grail, which in these scenes causes him pain in the very wound that corresponds to the spear-wound of Christ. As a priest figure who celebrates the Grail ceremony as a cultic repetition of the Last Supper, Amfortas is a representative of Christ and is identified somewhat mystically with Him. I maintain that this remains the case despite Amfortas' "fall" and his "original sin", which betray this role. That Christ and Amfortas are inextricably bound together is reflected by the circumstance that Amfortas was wounded with the same weapon and in the same place as Christ. Therefore Amfortas suffers not only physically (from the pain of the wound) but [also] spiritually (from his awareness of his guilt). Complex psychological processes, linking the drama about Christ with the drama of the fallen king, are made explicit for the first time in the second act, in Parsifal's response to Kundry's seduction, which develops the motivic complex of the Heilandsklage established in Amfortas' lament. In act 2, we realize that Amfortas' suffering is but one layer of meaning bound up with Christ's suffering as expressed in the Heilandsklage, whose deeper significance is now revealed as a divine lament intended for the ears of a redeemer. This formula, which is not found in the Prose Draft of 1865 [first appearing in that of 1877], has been the subject of much conjecture. What does it mean? Is the work intended ... to "further expound" the Christian dogma of redemption by God in that the classical order of redemption God- Man is complemented and completed here by the reversal, Man- God? Is Parsifal the human redeemer who is to redeem the Christian, divine Redeemer in that he restores the Holy Grail's function? Is Wagner theologically so audacious (or so hubristic) that he perfects the Christian act of redemption with a dialectic artifice in his own way? ... We would therefore do well not to overtax the formula of the redeemed Redeemer, theologically speaking, and to interpret it as the sum and substance of Parsifal's life. Parsifal can then by all means be understood as redeemer but under no circumstances as a substitute for the Redeemer, who could be identical with Christ or God [although Wagner does not make this identification in the opera.] In the awareness of the distance between him and God and Christ, but in the light of the act of redemption on the Cross he becomes the redeemer through compassion — for the seductive Kundry, for the suffering Amfortas and [for] the moribund community of the Grail: after having partaken himself of redemption from his blindness, his entanglement in guilt and instinctivity! It is thus not a question of a substitute redemption but of participation in redemption which is the principal theme of Parsifal with a clear emphasis on the active participation of mankind in the act of redemption, without God's previous act of redemption through Christ being denied or superseded. agner's drama has a Christian (or at least, religious; and if not religious, spiritual) dimension. Firstly since, like many of Wagner's earlier operas, it is concerned with redemption and redemptive sacrifice, and secondly there is a focus on compassion and self-sacrificing love. These themes are found in other religions, of course, and appear in a Christian context only because Wagner (with a predominantly Christian audience in mind) chose (mainly) Christian symbols, which religion would have us believe in their literal sense , with which to reveal his deep and hidden truth . Many commentators have tried to make a coherently Christian interpretation of Parsifal and given up in despair; it is a collection of vivid material without coherence, concludes James Mark; the work is made inconsistent, concludes Lucy Beckett, by a tension between irreconcilable pagan and Christian elements. ... if [Wagner] did not consider himself a nihilist or atheist, he certainly did not see himself as a Buddhist. He thought here less in opposites than in syntheses. It is my opinion that at a time when Christian, oecumenical theology has begun to open up the whole world as a forum for religious discussions that are to be taken seriously; at a time, that is to say, which has discovered, over and above the inter-confessional Christian dialogue, the inter-religious and global dialogue as a challenge, our interest should be keener in the historical experiment which Wagner undertook in Parsifal: the synthesis of Christian and Buddhist ways of thought. This attempt, which doubtless always seemed to earlier generations — particularly of Christian provenance — to be, in its wild amalgam of heterogeneous religious ideas, fatal syncretism, seems, seen from today's angle, like an unfulfilled desire for an oecumenical theology, whose interreligious future lies before it. If Arnold Toynbee's words are true, that our age will be remembered one day, not because the atomic bomb has been constructed, but because the dialogue between Buddhism and Christianity had been seriously started, then we may have the idea that in Parsifal a past is preserved which perhaps one day will be our future. Is Parsifal a Christian music drama? We need to answer "no" to this question if we wish to regard Wagner's last work as reinforcing the dogmas of the church, whether Protestant or Catholic. However, we can answer "yes" if we take the interwoven paths of medieval and modern mysticism seriously as components of the Christian tradition. Wagner's mysticism derives in part from the philosophy of Schopenhauer and in this respect is a mysticism without God. Parsifal thus seems to ask whether it is possible to have any kind of religion in an irreligious age. Like Der Ring des Nibelungen and Die Meistersinger von Nürnberg, Parsifal is an attempt to rescue the ideals of the age of revolution through art. Such ideals have nevertheless undergone substantial change. In his last music drama, Wagner propounds an ethic of nonviolence and advocates a reconciliation between man and nature. His attempt at forming a synthesis of Indian and Christian beliefs participates in an interreligious dialogue that is still being carried out today. Wagner was aware of the problematic nature of such a utopian vision. His longing for metaphysical solutions found a home in his music, where a resounding vision of nirvana is somewhat tenable. As an expression of this utopia, the cryptic sentence Erlösung dem Erlöser can be read as an assertion, or we can understand it as a call to undertake the redemption of the Redeemer. 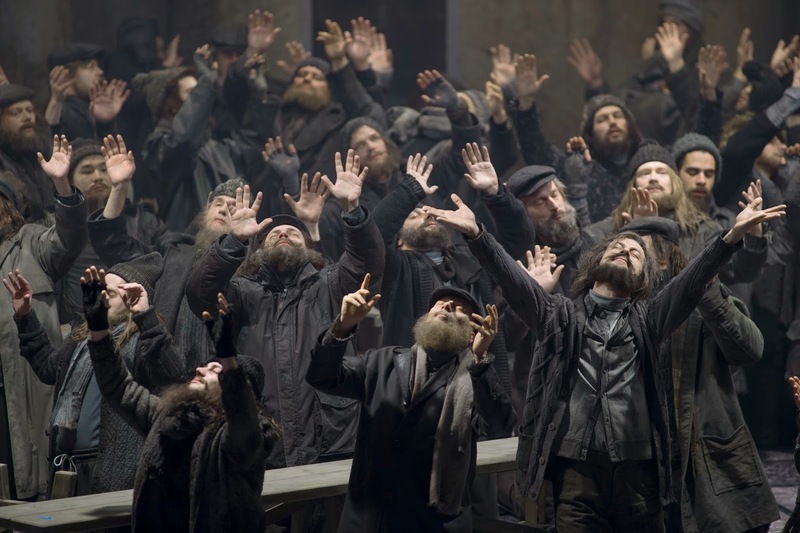 Above: Ecstatic grail knights in Dmitri Tcherniakov's production of Parsifal for the Berlin Staatsoper. Footnote 1: R. says, "I do not believe in God but in godliness, which is revealed in a Jesus without sin." Cosima's Diaries, entry for 20 September 1879. Concerning divinity, see: Religion und Kunst, GSD v10, p.215; PW v6, p.216.